When my husband was actively sneaking around in his affair he told me that he had made changes to second shift at work and he had to go back and ensure things were running smoothly. Because of the nature of his job I never questioned him. My biggest worry was that he returned home in time to get a decent night’s sleep. As I’ve said previously, sleeping in separate rooms because of his snoring certainly made these late nights possible without arousing suspicion. Fast forward more than two years and one evening a few weeks ago my husband said he had to go back to work to close the louvers. No big deal, right? But it seemed to take longer than it should. I know he gets sidetracked so I didn’t think too much about it. Then it happened the next night and the next and the next. By then I was deeply suspicious. I have the app “Find Friends” installed on our phones so I began checking. He was definitely at work. At least his phone was. So then my mind went places I had hoped it would never go again. He was having an affair. He either left his phone at work and went to her or had her meet him there. I wanted to trust. Oh how I wanted to trust! But I was convinced, no, I knew that he was up to something. I was right. After several agonizing days he sat me down to confess. My heart began to pound. My ears were ringing. I was prepared for the worst. It’s amazing how many thoughts ran through my head in the few seconds it took him to tell me what was going on. He wasn’t having an affair but he had been lying all along. He had lent money to an employee to purchase a dog and then due to unforeseen circumstances he couldn’t take the dog home. She was living in a kennel at the shop and my husband was going back in the evening to feed and play with the dog. I was furious and not very nice about it either. I felt betrayed all over again. Yes, it was betrayal on a smaller scale but betrayal just the same. His excuse? He “knew” I would say no about lending the money, not a small amount, so he just did it behind my back. And herein lays the root of the problem. In order get what he wants my husband will lie, either outright or by omission. He doesn’t trust me or our relationship enough to have open communication. During our heated discussion he further excused his actions by saying that he did this as a child as well and proceeded to give me a couple of examples that “turned out great” in the end. Not a good move on his part. Being deceptive is a way of life for my husband. During our EMSO class he admitted that he can justify anything to get what he wants. I can list many times during our marriage that he has deceived me in various ways. Post D-day I thought he understood how destructive his actions are to our relationship. Evidently not. So the heartbreaking question for me to ponder is whether or not my husband can change an ingrained trait. If not then do I leave or live with it. Neither option is very attractive to me. Learning of my husband’s infidelity certainly changed me. The obvious is that I’m less trusting, not just of my husband but of people in general. I second guess peoples’ motivations in ways I never have before. In my marriage I demand respect in ways I never had the courage to before. My husband responds positively instead of with anger. He’s less defensive. I’m trying to be less judgmental. His infidelity has changed us both. You can either return to old, bad habits such as drinking in excess or you can change bad habits. He goes on to ask the question, “So where do we begin? The problem with habits is that they are unconscious.” The first step has to be desire to change. Either you’re willing to put forth the effort necessary to rewire your brain and change a bad habit or you’re not. In Part 2 of his article Rick explains the steps necessary to change a habit. It doesn’t happen without effort. I read somewhere that it takes at least three weeks to change a habit. That’s three weeks of constant effort. When I discovered that my husband had deceived me again I was completely honest with him. I don’t know if it’s possible for him to change. I don’t even know if he wants to. I wasn’t very nice about it. Sure, he’s made a lot of positive changes but these were the easy ones to make. They didn’t take as much effort. Can he make the big change necessary for me to feel safe? Our entire marriage I haven’t confronted his behavior towards me. No more. That’s a change I’ve made for the better, in my opinion. Affair Recovery says over and over that they want to do more than just save marriages. They want to help those of us “affected by infidelity find extraordinary lives of meaning and purpose.” Rick and Affair Recovery seek to “let the crisis created by the infidelity serve as a catalyst for positive change…” This takes targeted action. I am no longer willing to settle for mediocre. I demand better for my marriage, for my life. My husband and I will either change for the good together or he’ll stagnate alone. My desire is that he wants to change, not for me, not for our marriage, but for himself. It’s up to him just as it’s up to you to make positive change. 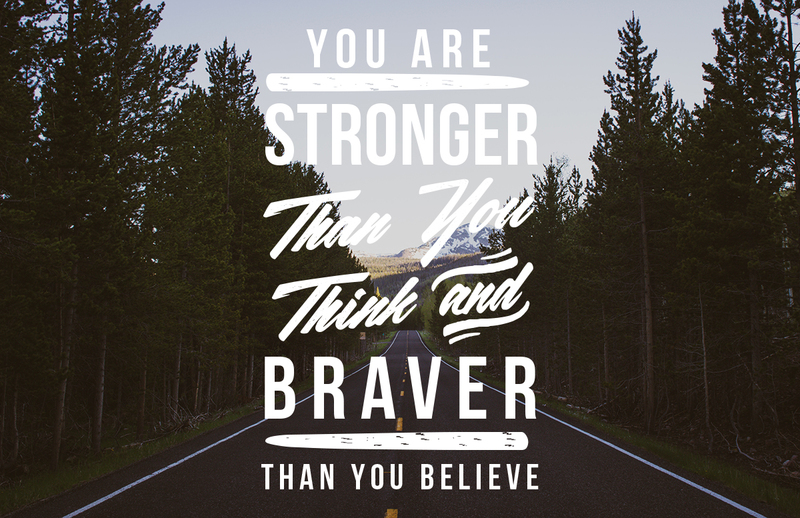 Remember, you’re stronger than you think you are, braver than you believe. Thank you for sharing that very personal detailed experience! I have been there so many times and still do not trust my husband 4 years since his last affair and 16 years since the first affair's D-day. Both times I discovered the truth and had to confront him, never has he confessed to an affair first. So, that makes me more suspicious about a "next time". Ugh! It's so stressful. It's good to know I'm not alone. I feel like 4 years should be long enough to make me feel safe, but not so. The fact is I still don't trust him. This blog really hit home. D-day of the second string of affairs is rapidly approaching and as much as I try to get my footing to prepare myself, it's like the days go in fast forward. I find myself triggered so often I can't keep up. The multiple betrayals, the anniversary of my abusive father's death, personal health issues yet to be resolved and D-day falling on Thanksgiving this year all loom heavily on me. I found out my husband was cheating again during a health crisis which was exaserbated by stress just a few days after learning that my estranged father had passed and two days before Thanksgiving. After several months of seperation, we decided to give us a shot. To both put in the grueling work it would take to give our marriage the fair chance it deserved but never had since the discovery of his affairs two years prior....maybe since the day we said I do even. We've since both done a lot of work toward change. But, you're right, the habits are a real pickle! I am very introverted but also extremely expressive. I have no problem letting you know how I feel, why I feel and what I expect to be done about it. My husband, not so much. He's an extrovert but he internalizes all of his emotions to the point that he can't even identify his own feelings at least until a good bit of time has passed. He's a hindsight feeler. I have seen so much of his behavior stay the same...forgetting to update his schedule, changing it on a whim, getting no relief in expressing himself when he has an issue, allowing me to be "out of the loop". My greatest struggle in our attempt at reconciliation has been trust. I mean, with my own history of abuse from basically everyone, parents, grandparents, other relationships, I brought trust issues in a great big trunk of baggage into the marriage. His infidelities put a few padlocks on that trunk! But trying to trust intentions is now my work. Damn if it isn't daunting. How do you trust intentions? Invisible as they are, the idea that someone can conduct themselves through life, yielding similar if not the same results but for different reasons. There is nothing tangible, no hard facts to touch and hold onto. I'm not a person of faith, I am not religious, I consider myself an atheist in fact. I have no resource to draw from. So how does one take stock in parallel behaviors but believe they will yield a different result because the intention is different? How do you trust things are happening for different reasons when all you have to trust is the unknown, unproven word of someone who has broken trust (more than once)? I've been trying for 4 years. I've been trying for 4 years... I've made a few changes but it's been difficult because he has drip fed the truth over that time and the affair/deception lasted 20 years (38 year marriage) ..mostly with the same woman. I am stronger but I am emotionally exhausted and beyond tired. I'm not healed because he won't help. He's only done the bare minimum and becomes abusive when I ask questions that might help me understand. I give up. I am only going to take care of me and if nothing changes, will continue as roommates until death do us part.....or until he cheats again. I can't open up my heart when I don't feel safe. Too risky. I don't know a way to contact you Lisa. I just wanted to check in with you. I really miss your blogs. Our time line is very similar and issues with our husbands a lot alike. I found comfort I guess in hearing from another betrayed spouse. I am praying that you are okay and things are going well . D-Day was exactly 11 months ago today. We have been in counseling for 10.5 months. How do I know if he will ever change enough for me to feel safe? Our counselor says that until he learns to communicate with me, then there is a good possibility of him cheating again. How long do I give him? How do I know that he is really trying(like he says he is)? How of I know that I am not wasting my time waiting and hoping he will change?